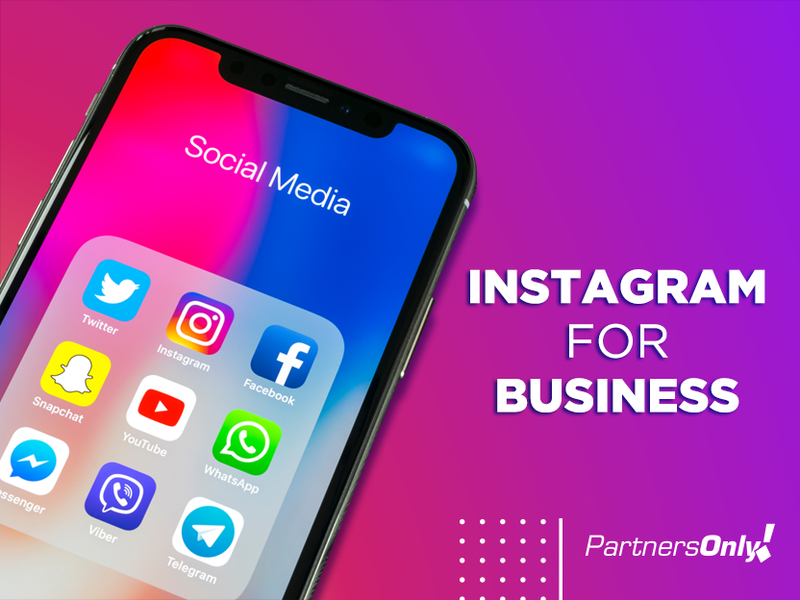 Home / PartnersOnly Academy / Instagram for Business: How it works and what to use it for? Instagram is a social media network that has many functionalities focused on the posting of pictures and images. As time goes by, this social media is turning into a very appealing working tool too, thanks to its potential. As it happens with other social media networks, companies could create their own commercial profile, advertise and obtain data from their followers. How to create an Instagram for Business account? Step 1 – Download the app. In order to get started, download the app. Step 2 – Create your account. Click on the option Create an Account, and then include your email and password. Step 3 – Choose a username. Because Instagram is related to Facebook and Twitter, we recommend you use the same username for all social media, this way you will increase your chances of being found by your audience. Step 4 – Make a description. It should not be too long, but you cannot forget to write down a few relevant pieces of info that describe your business, as this will work as a presentation. Step 5 – Choose your profile picture. For your profile picture, you could use your creativity. This being said, we recommend you stick to using your brand’s logo. In case you are an affiliate and do not have a logo, you could go with the same image you have at other social media to make the association easier for your followers. Step 6 – Announce yourself. After you have created your account, the first action will be to announce yourself on other social media. This way, you will allow your followers to follow you on yet another social media network, getting more visibility. Step 7 – Follow others. The last step, and also the second thing to do after your account is created, is to follow different profiles that would be influencers within your segment, as this will also announce yourself, increasing visibility. 1. Use the Promote tool: Choose a post and add a CTA, getting your followers to interact, select your main audience and define the time you will promote a post, in order for your posts to get better reach. 2. Be selective on your images: They are the base force for Instagram. The main message must be present within the image you will be using, as the focus is to say things through a visual aid and not through words. This is why your images must be creative and originals, reflecting the image of your business. Of course, good resolution is a must. 3. Insist on using hashtags: Incentivize your followers to use certain hashtags that will promote interaction between you and your customers. But choose your hashtags correctly, so they are not too common nor extremely complicated. 4. Transmit a way of life: Through your posts, you will show ideas and values that could be used as your own directions and path, in order to generate branding, not just through the products you may sell but also through your mission and vision. 5. Plan ahead: It doesn’t help to post images randomly, the best way is to define an objective and create strategies to reach it. Consider content and posts frequency. 6. Increase your brand’s value: Besides your brand’s focus, you should also post images that will be related to sustainability and social awareness, since that will be linked to your business. 7. Use proper text: Messages must be kept short, this is why, the biggest challenge will be to think of direct, clear messages. Keep in mind that the most important thing will be in the image you use and the text must be just the closing of the main idea. 8. Use and abuse of stories: They are the ones that generate engagement, then share your routine, staying closer to your audience. Do you already use Instagram for Business on your daily activity as an affiliate? If not yet, then think of your objectives and take advantage of this social media that has so much to offer. IF YOU ARE NOT YET WORKING WITH US, DO NOT MISS OUT ON THE CHANCE, REGISTER NOW!